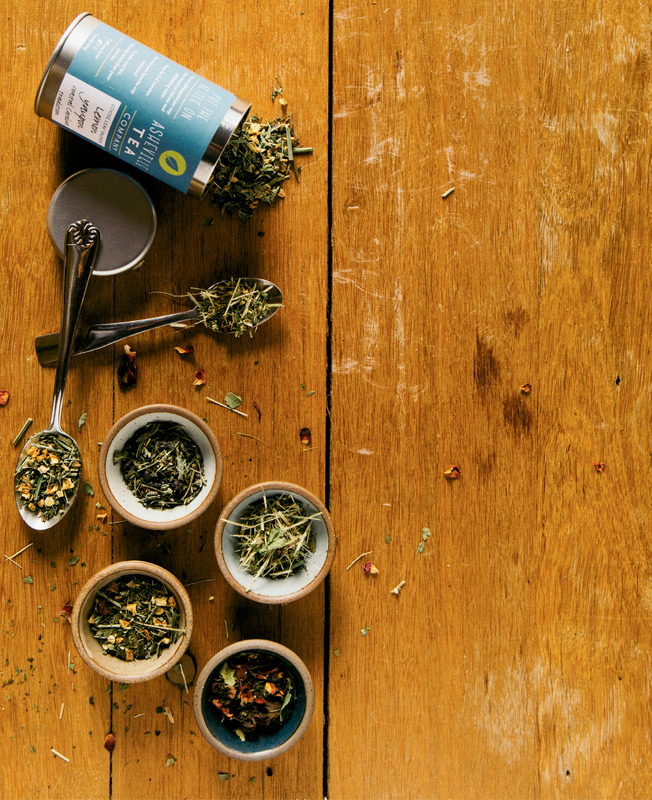 Unlike most tea companies that get their blends from far-flung locales, the juniper berries and lime basil in Asheville Tea Company’s blends haven’t traveled the world on their journey from harvest to teapot. These ingredients are grown less than three miles away from Ashe Spring Farm Food Hub in Barnardsville where the tea is blended. Dean, a former outdoor educator and wellness camp director, has doggedly pursued local ingredients during the company’s first year. “It’s been an adventure in sourcing and it’s definitely informed the recipes,” she says. She works with several local growers including Rayburn Farm in Barnardsville, Epling Farm in Horseshoe, and Pangea Plants in Lake Lure. In addition to making herbal blends, Asheville Tea Company also offers caffeinated brews. Green and black teas don’t grow well in WNC, so Dean sources Kenyan black tea imported by Table Rock Tea Company in Pickens, South Carolina, then adds local wild lavender and bergamot to make her Wild Earl blend. Her green tea, G & Tea, blends camellia sinensis leaves with locally grown lime basil, rosemary, and juniper for a non-alcoholic play on the classic gin and tonic cocktail. Another specialty of Dean’s is a tea made from a hard-to-find caffeinated plant that thrives in the southern United States. Yaupon is a shrub in the holly family that has been used in Native American medicine for centuries. It’s gaining popularity on food blogs as a sustainable source of caffeine but is rarely found on menus because it’s hard to source. The company makes two blends with yaupon from Savannah, Georgia: a lemon blend with lemongrass, lemon peel, and lemon balm, and an elderberry blend with hibiscus, blackberry leaf, and rose hips. Dean is ushering her company through its first spring, a time to build collaborations with farmers who can grow new ingredients for her this season. She’s on a mission to craft a local beverage that connects the farmers who sow the seeds with everyone who sips her tea. Curious about locally blended teas but not sure where to start? Asheville Tea Company presents monthly Tea Talks at Ivory Road Café and Kitchen in Arden. Spring dates are March 5 and April 16. Find details and register at www.ivoryroadavl.com. Asheville Tea Company’s blends are available at The Rhu in Asheville, Ivory Road Café and Kitchen in Arden, and online at www.ashevilleteacompany.com.